Today, Fujifilm has introduced the FUJINON GF250mm F4 R LM OIS WR, a new addition to the roster of telephoto lenses for the FUJIFILM GFX 50S medium-format mirrorless camera system. With 16 lenses in 10 groups, this telephoto offering promises excellent color reproduction, three-dimensional image quality, ultra-high resolution and rich bokeh. The new telephoto lens will be available in late May 2018. The GF250mm F4 R LM OIS WR is also built with a five-stop optical image stabilization and a new focus preset function for instant activation of previously saved focus settings. It’s also dust and weather-resistant, with a lightweight and rugged magnesium alloy lens barrel and can withstand temperatures as low as 14°F/-10°C. Its fluorine-coated front lens element also repels water and dirt, even in the most challenging outdoor conditions. On top of the new lens release, Fujifilm also announced some new firmware updates for GFX, X-H1, X-T2, X-Pro2, X-E3, and X100F, set for April and May 2018. Valhalla, N.Y., April 12, 2018 – FUJIFILM North America Corporation today announced the launch of the FUJINON GF250mmF4 R LM OIS WR, a lens that expands the telephoto range for the FUJIFILM GFX 50S medium format mirrorless digital camera system. When combined with the GFX medium format sized sensor with an area approximately 1.7 times larger than 35mm format, the GF250mmF4 R LM OIS WR lens achieves exceptional image quality. Composed of 16 lenses in 10 groups, this lens delivers unsurpassed color reproduction, three dimensional image quality, as well as ultra-high resolution and rich bokeh. 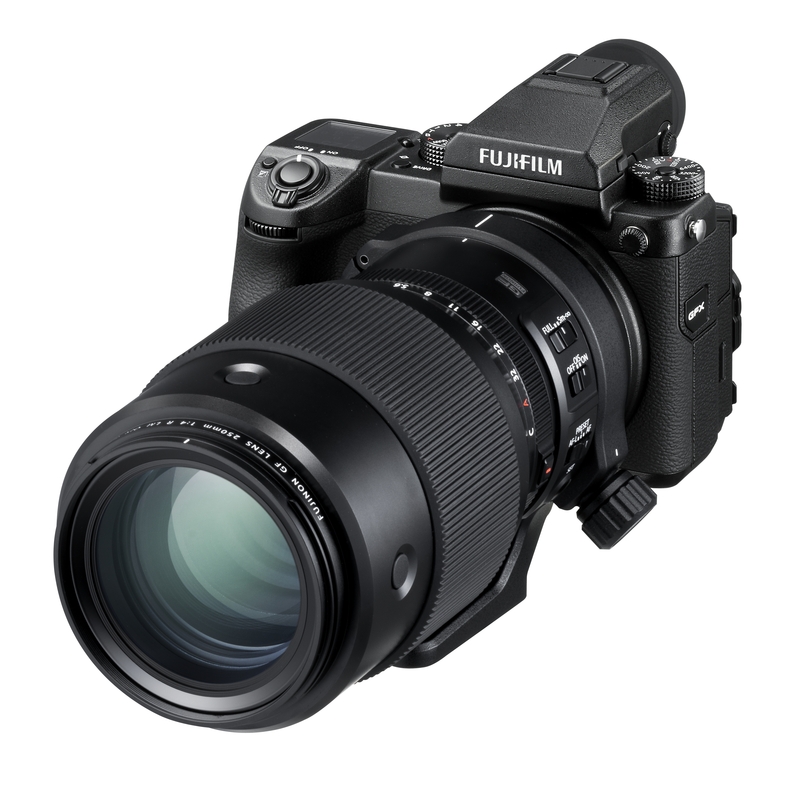 In addition, this telephoto lens is equipped with a powerful five-stop optical image stabilization and a new focus preset function, which allows the photographer to instantly activate focus settings previously saved in the lens memory. With a rugged, lightweight magnesium alloy lens barrel designed to be dust and weather-resistant, the GF250mmF4 R LM OIS WR is capable of operating in temperatures as low as 14°F/-10°C. The front lens element has a fluorine coating designed to repel water and dirt even under tough outdoor conditions. Ultra-high image quality achieved with16 lenses in 10 groups, 1 super ED lens and 2 ED lenses. Powerful five-stop optical image stabilization to maximize high image resolution. Silent, high-speed autofocus operation and new mechanism to fix linear motor position. when turning power off or when in playback mode. Available with new GFX 50S firmware. Made with magnesium alloy, ensuring a robust, durable body. Dust and weather-resistant design capable of operating in temperatures as low as 14°F/-10°C. The new FUJINON Teleconverter GF1.4X TC WR is designed for use with the new GF250mmF4 R LM OIS WR giving approximately 277mm in 35mm format equivalent, without compromising image quality. The MCEX-18G WR and MCEX-45G WR Macro Extension Tubes further expand the range of macro photography. Connecting these macro extension tubes to GF lenses allows for images to be captured at high magnification ratio. The MCEX-18G WR and MCEX-45G WR Macro Extension Tubes are compatible with all existing GF lenses. The new FUJINON GF250mmF4 R LM OIS WR lens will be available in Late May 2018 for USD $3,299.95 and CAD $4,124.99. The FUJINON Teleconverter GF1.4X TC WR will be available in Late May 2018 for USD $849.95 and CAD $1,059.99 and Macro Extension Tubes, MCEX-18G WR and MCEX-45G WR will both be available in Late May 2018 for USD $329.99 and CAD $409.99. Fujifilm will release new firmware updates for the FUJIFILM GFX 50S, X-H1, X-T2, X-Pro2, X-E3 and X100F. Updates will vary by model and are expected in April 2018 and May 2018. Compatible with the newly developed FUJINON GF250mmF4 R LM OIS WR lens including “Focus Preset,” “AF-L” and “AF-ON”. Addition of “Flicker Reduction” to reduce flicker in both pictures and display when shooting under fluorescent lighting. Addition of “Select Folder” and “Create Folder” allowing users to choose the folder that images are stored in and to create a new folder. New “Large Indicators Mode” enabling users to enlarge indicators and information in the viewfinder and/or LCD monitor and to customize the location of where the information is shown on the display. Addition of Fn button support for “35mm Format Mode” for quick setting changes. Addition of Focus Bracketing allows the photographer to shoot focus distance bracketing of up to 999 frames. Compatible with new cinema lenses FUJINON MKX18-55mmT2.9 and FUJINON MKX50-135mmT2.9. Enlarged and customizable indicators and information in the viewfinder and/or LCD monitor. Users can also customize the location of where information is shown on the display. Expanded Phase Detection AF Area options during still shooting. Enhanced Bluetooth® connectivity with FUJIFILM Camera Remote app. Addition of Fn button support for “IS Mode”. Addition of Focus Bracketing allowing the photographer to shoot focus distance bracketing of up to 999 frames. Addition of F-log SD card recording. Addition of 1080/120P high-speed video mode ideal for recording slow motion footage. Enhanced Phase Detection AF to improve performance in various shooting environments. Supports FUJIFILM X RAW STUDIO. Support for backup/restore of camera settings via FUJIFILM X Acquire when the camera is connected to a computer. Compatible with the newly developed FUJINON XC15-45mmF3.5-5.6 OIS PZ lens. Improved radio flash controller usability allowing users to shoot with compatible third party studio flash in high speed sync or TTL mode via a radio controller.